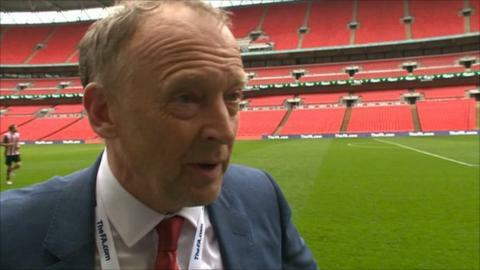 Sholing manager Dave Diaper described his side's 1-0 FA Vase victory over West Auckland as "surreal" as he ended his 15-year reign at the club. Marvin McLean scored the only goal of a tightly-contested affair. Diaper says it was the perfect way end to his management career at the club, with Mick Marsh and Dave Fear becoming the new co-managers of the Boatmen. "I'm going out at the top and and I'm never going to better this," Diaper told BBC Radio Solent. The victory at Wembley was watched by over 5,000 supporters and Diaper admitted their achievements had not yet sunk in. "It's really surreal, it's been the best weekend of my life," he said. "To walk up those steps and lift the trophy was the best feeling in the world. We are still high as a club and individuals." Goalkeeper Matt Brown was voted man of the match and Diaper also paid tribute to him. "I really felt for Matt," he said. "It was only Wednesday last week that we declared him fit. "He was really good and pulled off several key saves to keep us in that first half. I was really pleased for him." Sholing's players got to parade the trophy around St Mary's Stadium ahead of Southampton's game against Manchester United at the weekend. Diaper added: "All the players deserve the credit because there have been eight or nine rounds of football."